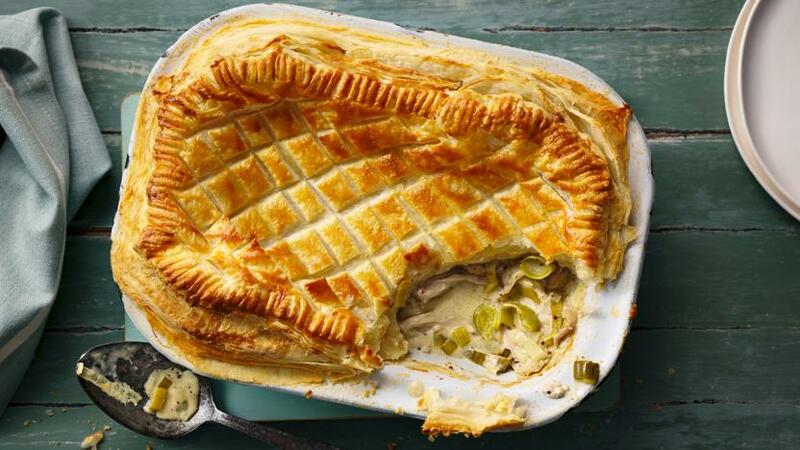 A classic recipe for chicken and leeks in a white sauce topped with shortcrust pastry. For the pastry, sift the flour and salt into a large mixing bowl. Add the lard and butter and, using your fingertips, rub the fat into the flour until the mixture resembles breadcrumbs. Lift the flour into the air as you do so, to get some air into the mixture and keep it cool. Add just enough cold water to form a dough and mix together with a palette knife. 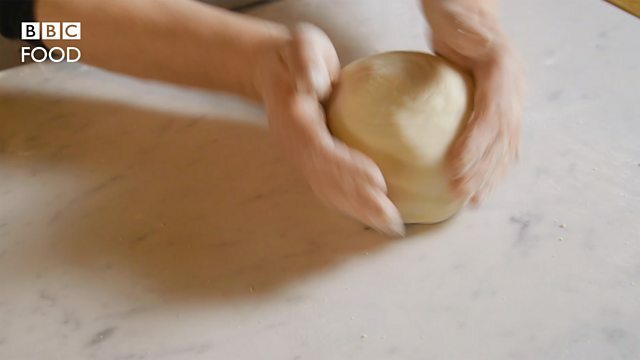 Then, using your hands, bring the dough together in the bowl. Turn it out onto a clean, floured work surface and knead briefly. Shape it into a flattened circle and wrap it in cling film. Chill in the fridge for at least 20 minutes. While the pastry is chilling, make the white sauce. Melt the butter in a heavy-bottomed pan. Add the flour and stir with a wooden spoon over a medium heat for a minute or two, being careful not to burn it. Add the milk all at once. Take off the heat and whisk the mixture with a balloon whisk. Once all the lumps are whisked in, place the pan back onto a medium heat and whisk continuously until the sauce comes to the boil and thickens. Cook for another five minutes, stirring frequently with a wooden spoon. Add the double cream, mustard and the crumbled stock cube. Stir well, then allow to cool. For the filling, top and tail the leeks. Slice them into thick rings and wash thoroughly in a bowl of clean water, to remove any grit. Heat a heavy-bottomed pan and place the leeks into the hot pan. Add the butter. Add the apples to the pan with the leeks and cook for a few minutes. Add the bacon lardons and the chicken pieces to the pan and cook for a few minutes longer (the chicken will be only about two-thirds cooked at this stage). Preheat the oven to 200C/400F/Gas 6. Place the chicken mixture into a pie dish. Sprinkle the tarragon leaves, if using, over the top. Season with freshly ground black pepper. Pour over the cooled white sauce. For the pastry top, allow the pastry to get up to room temperature. Lightly flour a clean board and roll out the pastry into a rectangle about one-and-a-half times the size of the pie dish. With a knife, trim long, half-inch wide strips from the pastry. Use the trimmings to make an edge around the pie dish by brushing them with a bit of water (to help the pastry adhere) and placing them in a single layer around the outer edge of the pie dish. Using your rolling pin, lift the remaining pastry sheet and place it on top of the dish to form a lid. Trim around the edge of the pie dish with a knife to cut off the excess pastry, reserving the trimmings. Use your fingers and thumb to crimp the edges. Make a hole in the centre to allow the air to escape. Brush the top of the pastry with the beaten egg and salt wash. Use the reserved pastry trimmings to decorate the top. Place the pie on a baking tray and bake in the oven for 25-30 minutes until bubbling hot and golden. Serve while hot.